The Irmão José Otão Main Library of Pontifical Catholic University of Rio Grande do Sul (PUCRS) is an unit of the Academic-Administrative board of the Office of the Vice President for Undergraduate Studies and Continuing Education (PROGRAD). Offers a space of 21 thousand square meters in 14 floors, joining technology, services and resources to encourage user autonomy in Library usage. Strategically located at the core of the PUCRS Campus, the Irmão José Otão Main Library had its origins in 1940, in the collection of the Schools of Economics, Philosophy, Social Work and Law, located next to the Rosário Marist School. In 1967, with PUCRS’ relocation to the current University Campus, the Library was moved to the second floor of the Higher Administration Building. In 1977, it was transferred to its current location, in an area comprising 10,000 square meters. In 2008, commemorating the University’s 60th anniversary and the Library’s 30th anniversary, the Library reinaugurated its facilities, expanding its physical space by integrating a 14-story tower to its previous building. Such an expansion enabled the creation of specially designed spaces for knowledge production and cultural dissemination, as well as the physical reorganization of the collection. The Library’s strategic objectives to support teaching, research and extension activities are promoting communication with its users through different media; offering continuous training activities, and providing sources and innovative technologies for information access. 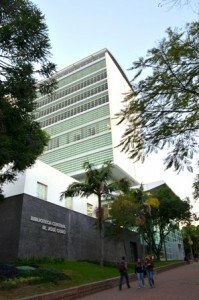 Open to the general public and providing free access to its collections, it has additional facilities in the School of Medicine, next to PUCRS São Lucas Hospital. Specialist knowledge and targeted support to the PUCRS University research community across the research lifecycle (scientific research, publication, scientometric and bibliometric resources and tools). Bibliographic search, loans, Internet, databases and dedicated services. Technical processing of information resources. The reinterpretation of Piet Mondrian’s lines, evoking the idea of “windows to the world of information”, marks the color and design of indoor spaces and is present in floor, wall, door and totem signage. Environments are integrated, air-conditioned and designed for use of multimedia resources. The Library offers rooms for individual and group study, ample cultural space and dedicated floors for reading and studying, complemented by reading areas with abundant natural light and privileged Campus view, reinforcing a sense of integration with nature. Access, mobility and use of services by people with special needs are facilitated by ramps, elevators and appropriate furniture. Audiobooks, computer programs and appropriate equipment are provided to visually impaired users, in a service open to the general public. The Library provides information in various media, including print and electronic sources, which can be accessed locally and remotely from different devices such as computers, laptops, smartphones and tablets. The main collection, consisting of books, journals, theses, dissertations and multimedia materials, is physically grouped and organized in four major areas: Humanities, Applied Social Sciences, Science and Technology, and Language and Arts. Eletronic collections are also available with references and full text of books, journals, databases, patents and conference proceedings. Besides, the full collections in the CAPES Journal Portal are available to be accessed by PUCRS’ community. OMNIS is the search tool used in all libraries of PUCRS. Based on the innovative concept of “discovery” (based on PRIMO software by Ex Libris), OMNIS provides access to information contained in collections of PUCRS’ libraries and also in relevant global scholar resources. It has a single and consolidated search interface. Search results are presented in a unified list, sorted by relevance criteria, allowing faceted filtering, integration with reference managers, sending of results by e-mail, and instant access to full text. Allows the academic community to use computers outside the University network to access the Library’s online research sources. It has computer equipment and structure that allow efficient information management, access, and user services. A pioneer in the adoption of the Aleph Integrated Library System in Brazil, the Library has used this system since 1993 in information management processes, as well as to record library circulation. Adopted for identification and tracking of different items in the collection, it facilitates collection management for inventory and shelf organization, and it makes lending and return operations more efficient. Allow the user to register loans and returns using interactive software with step by step guidance. Fully integrated into the Library management system, users can register transactions, liberate or activate the security system and issue receipts indicating the date of return of borrowed items. Selfcheck-in machines sort returned items according to the four areas in the Library and Reservation status. Digital lockers with volatile passwords, monitored by closed-circuit TV. participation in information networks and cooperation programs. From Monday to Friday: from 7:35 a.m. to 10:50 p.m.
Saturday: from 7:35 a.m. to 5:30 p.m.
Atualizada em 19/02/2019 às 11:34.